Combine flour cornstarch, salt, and sugar in a food processor with three1-second pulses. Scatter butter pieces over flour, pulse to cut butter into flour until butter pieces are the size of large pebbles, about six 1-second pulses. Sprinkle 1 tablespoon over water mixture and pulse quickly to combine;repeat, adding water 1 tablespoon at a time and pulsing, until dough begins to form small curds that hold together when pinched with fingers (dough should look crumbly and should not form a cohesive ball). Empty dough onto work surface and gather into a rough rectangular mound about 12 inches long and 5 inches wide. Starting at the farthest end, use the heel of your hand to smear a small amount of dough against the counter, pushing firmly down and away from you, to create a separate pile of dough (flattened pieces of dough should look shaggy). Continue process until all the dough has been worked. Gather the dough into a rough 12 by 5-inch rectangle mound and repeat. Dough will not have to be smeared as much as first time and should form a cohesive ball once entire portion is worked. form dough into a 4-inch square, wrap in plastic, and refrigerate until cold and firm, but still malleable, 30 minutes to 1 hour. Adjust the oven rack to middle position and preheat to 400º. Peel, core and halve the apples. Cut the apples into thin 1-8-inch slices and toss with the lemon juice. Place the dough on a floured 16 by 12-inch piece of parchment paper and dust with more flour. Roll dough until it just over hangs the sides of the parchment and is about 1/8-inch thick, dusting top and bottom of dough and rolling pin with flour as needed to keep dough from sticking. Trim dough so edges are even with the parchment paper. Roll up 1-inch of each edge and pinch firmly to create a 1/2 in border. Transfer dough and parchment to rimmed baking sheet. Starting in one corner, shingle sliced apples to form even rows across bottom of dough, overlapping each slice by about one-half. Continue to layer apples in rows, overlapping each row by half. Sprinkle the apples evenly with the sugar and dot with the butter. 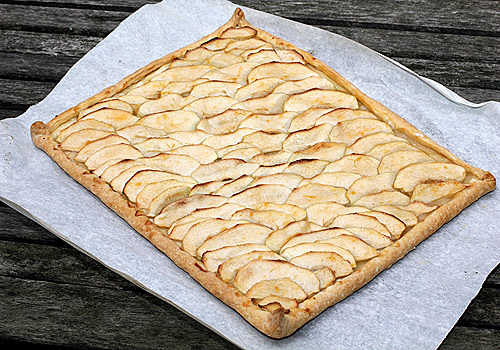 Bake until bottom of tart is deep golden brown and apples have caramelized, 45-6o minutes. While the galette is cooking, combine apricot preserves and water in a small microwave-safe bowl. Microwave on medium power until mixture begins to bubble, about 1 minute. Pass through a fine-mesh strainer to remove any large apricot pieces. Brushed baked galette with the glaze and cool on a wire rack for 15 minutes. Transfer to cutting board. Cut into individual portions and serve now or at room temperature. Enjoy! Nicole -- You.Are.Amazing. Let me just share with you that my daughter is eating Fruit Loops for dinner as we speak (we had a very late lunch). Ha - quite the contrast! I must say that I love the tradition you have set up with your family...you've inspire me to do something similar. Thank you for the lovely comment! One of my reasons for this blog is to inspire people to bring food to the home table. Happy cooking! What a wonderful family tradition. I love the idea of Sunday dinner, though when I've tried it myself, I always ended up starting the work week exhausted. So, I switched to Sunday noon or Saturday evening - perfect! I can't wait to share the recipes for dinner lastnight. It was "didn't want to leave the table good"! We haven't had this tart in many months (I try to be a seasonal cook). When we took a bite last night...swoon! It is just so perfect in its simplicity. Instead of taking leftovers to school, my children opted to savor it at home for an after school snack. Love 'em! this is one of my favorite desserts and yours looks absolutely perfect!